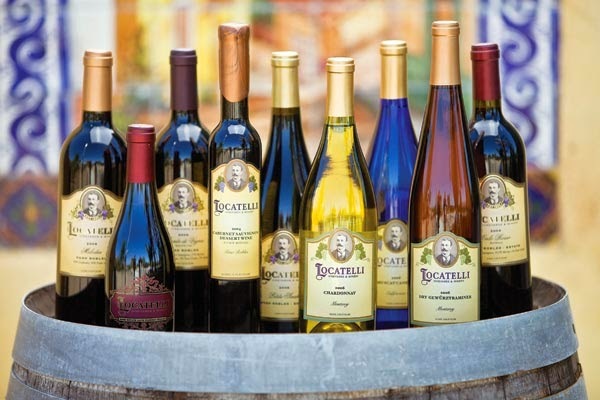 Locatelli: Excellent wines are made from excellent grapes. I met Louie and Raynette Gregory mid-summer in 2011. I made an appointment to taste wines at La Vigne winery which is a large production winery between Paso Robles and San Miguel. I lost track of how many wines that I tasted at La Vigne but the only one that impressed me was a Chardonnay, which was quite good and considerably better than the rest of their wines. I was probably at La Vigne for about an hour, I had figured on spending much more time there but with only one wine that was truly impressive I knew that there was no reason to talk to them about possible distribution in Alaska. Here I was out in the middle of nowhere at 11:00 am with no place to go, so I got out my trusty vineyard map and started searching for wineries in the area. After a few minutes I had circled a few names on the map and after calling them found only one that had time to meet me today. It was Locatelli Winery, I had never heard of them but some of my best finds have been while free styling, so after a few wrong turns I found myself on a long dirt road that led to Locatelli's Winery and tasting room. The winery is located between San Miguel and the hills to the east, and about seven miles from Paso Robles. As I entered their tasting room I was pleasantly surprised to find that I was the only one there, which means that I could talk business and taste wine without having to wait until the tasting room emptied out. I identified myself to the lady behind the tasting bar who identified herself as Raynette, one of the owners. It’s always great to taste wine with an owner since they have the authority to make decisions, anyway, we started with their white wines which were Pinot Grigio and Muscat Canneli, I was really impressed with both wines. The Pinot Grigio had an aroma of peach blossom and flavors of grapefruit and peach with just a kiss of honey, what impressed me most was the balance, the sweetness and acidity where perfectly balanced, my first thought for pairing was spicy Thai or buffalo wings and of course any grilled white fish. The Muscat Canelli had an aroma of honeysuckle and flavors of candied peach and spice and would pair beautifully with Creme Brulee or soft goat cheese. With such an impressive start on the whites I was a little fearful about the reds since some wineries are good on either one or the other, and the winery that I had visited earlier in the day didn't have any red that I really liked. Anyway, the first red that I tried was their Luna Piena which is a Merlot dominate blend with a little Cabernet Sauvignon and Cabernet Franc thrown in for good measure WOW!! With aromas of crushed blackberry and vanilla and flavors of rich black cherries and plum I was blown away and the finish lasted forever and ended with soft fine grained tannins. How in the world could they top this I thought. Next I tasted their Malbec, then their Cabernet Franc and finally their Cabernet Sauvignon. It’s hard to say which one I liked best and I could go on forever describing their wines but, I guess the real proof is that we brought in every wine that I tried and we can never get enough to satisfy our customers.